It is the world’s tallest free-standing broadcasting tower reaching its full height of 634 meters, which was opened to the public on May 22, 2012. I personally would like to visit these magnificent buildings which are bearing the future of Japan myself. And I’m sure that they will release a movie based on people surrounding the Tokyo Skytree and their sensitivities, just like the Tokyo Tower. 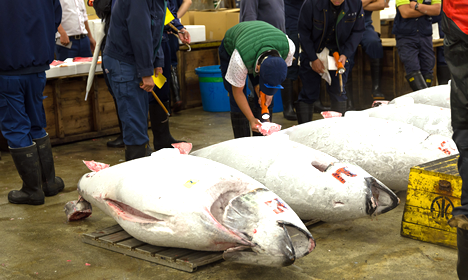 It is known for “Uogashi” or a riverside fish market and “Yacchaba” or a fruit and vegetable market. 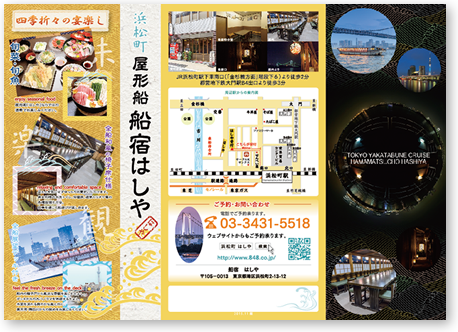 The Tsukiji Market is the area that is attracting world-wide attention not only for its future development but also as a tourist attraction. The number of foreign visitors is increasing day by day. As for the issue of its relocation, I wish for a swift safe conclusion. This bridge was opened to traffic in 1993. 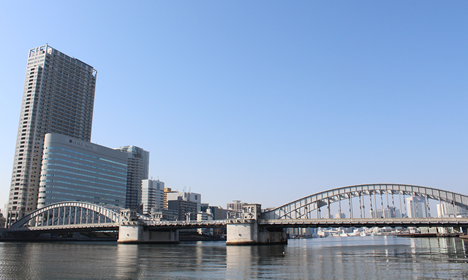 This suspension bridge connects the city center and the new Tokyo waterfront subcenter which is quickly developing. 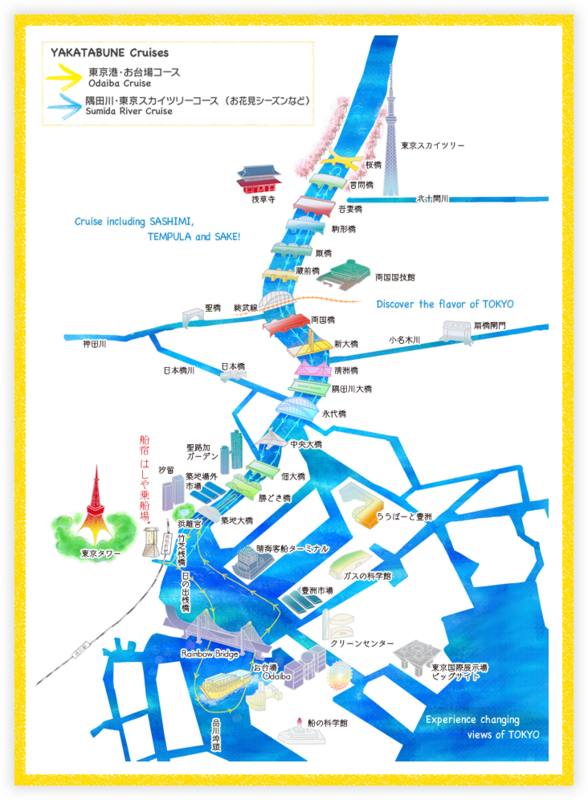 Its official name is “Tokyo Bay Connecting Bridge”. It sounds so rigid, doesn’t it? Its illumination changes in color depending on events throughout a year in addition to its regular illumination. 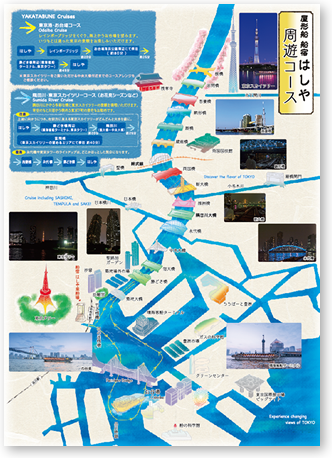 These special events include its “annual year-end special light-up” event where the bridge illuminates in rainbow colors, the pray for a successful bid to host the Olympic Games, Pink Ribbon Campaign, etc. 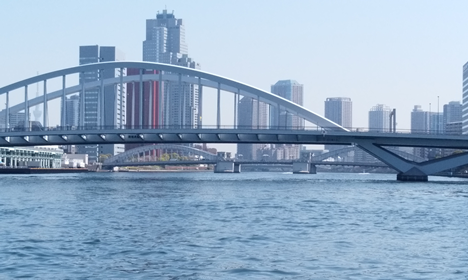 While looking directly up at the rainbow bridge, our Yakatabune boats navigate towards the Odaiba Seaside Park waters. Speaking of Daiba, there are Daisan-daiba or “No.3 Battery” which has been opened to the public as the Daiba Park from the early Showa period and Dairoku-daiba or “No.6 Battery” (currently a restricted area due to its preservation) which is an academically valuable reservoir of wild birds and plant life. 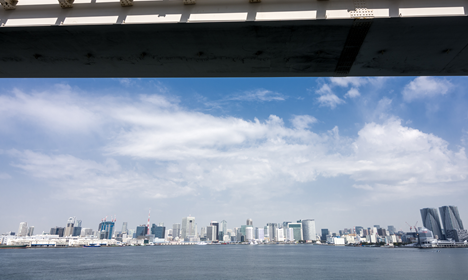 In 1979 with the completion of the land reclamation, No.13 was directly connected to the Daisan-daiba, and became established as Odaiba in the community. It is now one of the major tourist attractions in Tokyo. 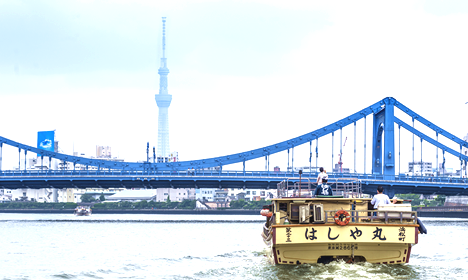 Our Yakatabune boat gets anchored for a time, so you can experience the beautiful view from the Odaiba Seaside Park waters. This is the gateway for liners to the Izu and Ogasawara Islands. It has become significantly more convenient to reach the Izu Islands since “Jetfoil” ships, which can sail at 80km/h, became in service in recent years. 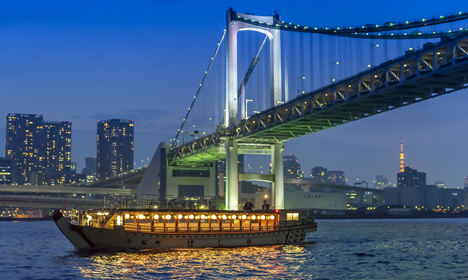 If you take one of our evening Yakatabune cruises, you can see a jetfoil ship passing by from our boat. This was built in 1991 to celebrate the 50th anniversary of the opening of Tokyo Port. Its landmark is a red triangle roof. Several luxurious large cruise ships stop here every year.